Let's talk about the Digital Classroom! 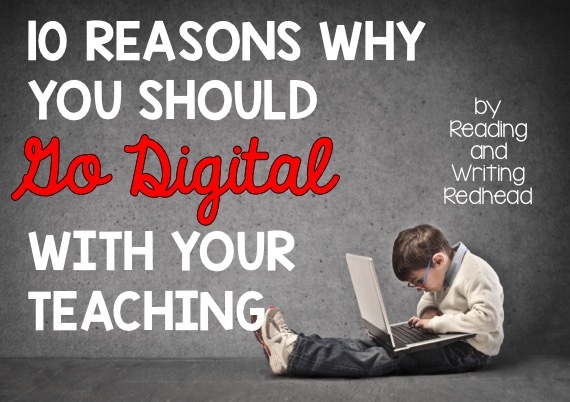 In the past two years, my teaching has begun to be transformed by the use of digital technology in the classroom and I think the benefits are worth shouting from the rooftops (or on the internet) to you! Now I am not talking about solely putting your students on an iPad and having them use an app, though that is very valuable in itself. I want to talk about why using digital interfaces and resources like Google Drive, Google Classroom, and other digital resources is totally worth it! I do not like waste, and paper and ink is probably a hot commodity at your school. When you have children complete just a few activities on Google Drive or using a digital resource, you can skip the printouts, copies and ink/toner usage. Yahoo! If you use a lot of these types of activities, imagine the reams of paper saved! Yay! Saving time is probably the most valuable thing for a teacher (well that and more sleep)! With digital resources or Google Drive resources all you usually need is a link to a certain webpage or doc. Occasionally a product or resource will come with a printable, but I have not seen many, and when I have, it is often optional. The only prep I have to do with Google resources is to either assign it through Google classroom or move it into a shared folder or share it with my students in Drive! Cinch! In particular, Google resources are easy to give feedback on, and in Classroom, feedback is facilitated too! You can offer support to your students via comments and feedback right away! Or wait until later, if you are in the middle of another task. What's fun about Google Drive in particualr is that you don't have to worry about bringing a pile of papers home! Unexpected sick day or snow day? Forgot your school bag? As long as you have yur device or computer and internet access you can correct , check and grade anywhere! Even Starbucks or the airport! Wow! Students can complete partner and group work collaboratively by sharing in Google Drive! Students no longer have to get together in person to get their project done. Thank you modern technology! Also, if it is an in class project or activity, and someone is absent - no big deal - they will have already shared their items or have access to the file from home and can still do their part! Digital learning works terrific with my second graders and I know teachers who have used Google Drive resources and Google Classroom successfully with students as young as kindergarten. Check out Della Larsen's blog, Della Larsen's Class, where she busts some myths about just that! You can also check out all the terrific ways she has incorporated digital into learning for kindergarten and grade one at her TPT store here! Google Classroom allows teachers to schedule out assignments in advance which helps us teachers with prep and planning! Let's face it, this type of digital learning and work is how children will continue to work and learn as they continue through their schooling. Experts in education and technology agree that classroom technology use IS only going to increase and students ought to be prepared for that by getting their feet wet now. Kids these days are often more engaged when working on a chrome book, computer, or tablet. 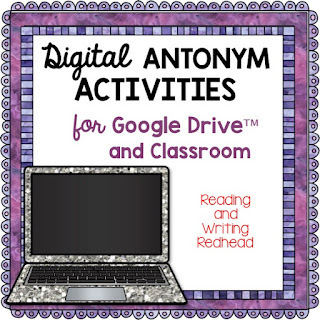 Take an antonym worksheet, give it to second graders, and then place the same students on a Google Drive Antonym Match activity like this one. Guess which one will have students more engaged? Students find more enjoyment out of working with technology, are more enthusiastic, and less likely (in my experience) to get off task, or get their classmates off tasks. Also students seem to be able to finish work more quickly (probably because they are more engaged) and less students seem to have to "finish up later". How great would it be to not have students with those 10, 20 or more incomplete papers in their cubbies or desks? Digital resources make it easier for you to differentiate for students - no copying multiple papers, etc. - you simply could assign different activities to students via Google Classroom or share different activities with students as you feel fit. You could provide some students with individualized resources for preview or review and reinforcement. With some Google Drive resources, some of the slides included may be a little harder and several may be easier so you could instruct some students to "complete slides 1-10" while other students may be assigned slides 11-20 (for example) depending on their needs. 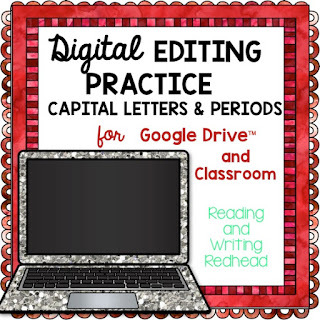 Would you like to check out come examples of digital resources and Google Drive ready resources? I have created my own resouces which I use with my second graders and which would work with grades one and two also. Take a look by clicking on any image below! Here is a walkthough video to show how the antonym match works in Drive. Trust me, it's a lot easier to peek at this for 1-2 minutes instead of me trying to explain it! The walkthough video for Digital Editing Practice! 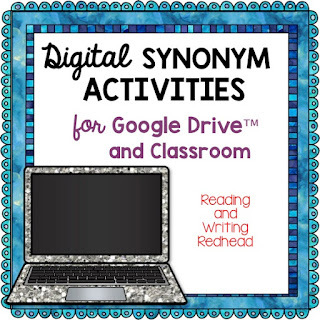 A quick walkthough of the Digital Synonym Activities. 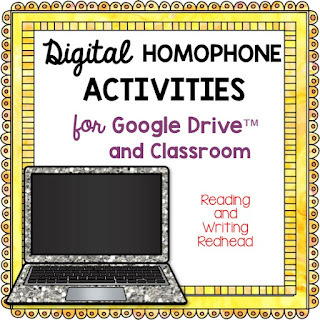 And here is your peek at the walkthough on Youtube of what the Digital Homophone Activities will look like! For a digital resource that does NOT require Google Drive, try Erintegration's Pick a Path Math Digital Interactive Story! Click here to check it out. My students tried it and had fun. You just need access to internet and to be able to use a bit.ly link (some schools block bit.ly).